Denise from There’s a Newf in My Soup was the hostess for this month's Daring Cooks' Challenge, which was Gumbo. This first thing I have to mention was the achingly beautiful photographs in the challenge write-up it was a joy just to view and read the challenge and the next thing I have to say is the outstanding work, effort and research Denise put into the recipes, clearly the best challenge write-up so far in the Daring Cooks' forums. 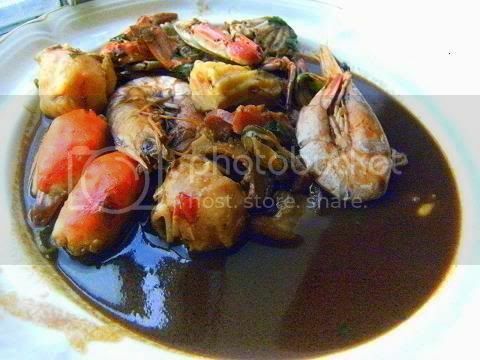 Gumbo what a smashing challenge the classic world famous Deep South soup/stew. 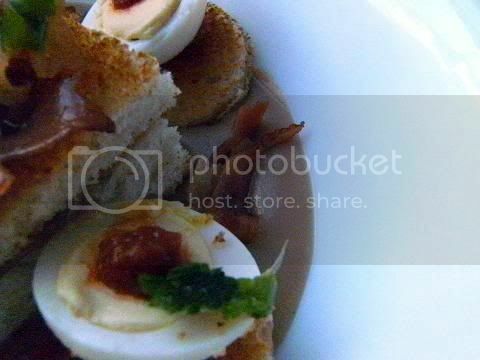 The photographs in the challenge looked so delicious and really whet the appetite for the recipes. And so many choices to pick from! After reading the challenge the common features of all gumbos are the rice served with it and the roux, there seems to be a lot of mystique surrounding the making of the roux, I was looking forward to see how I would handle this. Also my head was flooded with so many kinds of gumbo, the classic chicken and sausage, seafood, vegetarian or something totally new. Denise thank so much for the all the hard work and exquisite photographs you put into the write-up, and for all the impressive work, effort and research that is evident in the recipes, it is greatly appreciated. I liked the challenge so much I made six gumbos and a whole mess of side dishes. Recipe Source: The recipes for Drew’s Chicken & Smoked Sausage Gumbo and Seafood Gumbo, as well as the stocks, Creole spices, and rice, are from My New Orleans: The Cookbook, by John Besh (Andrews McMeel Publishing, October 2009). “John Besh is a chef and native son dedicated to the culinary riches of southern Louisiana. At each of his six acclaimed restaurants (August, Besh Steak, Lüke, La Provence, American Sector, and Domenica) as well as in his entrepreneurial pursuits, his first cookbook, My New Orleans, and his public activities, he celebrates the bounty and traditions of the region. A former U.S. Marine, Besh has been honored by Food & Wine ("Top 10 Best New Chefs in America;") Gourmet Magazine ("Guide to America’s Best Restaurants;") Food Arts (Silver Spoon Award;) and the James Beard Foundation (Best Chef – Southeast.) John Besh is a frequent guest chef on NBC’s Today Show, and has appeared on top programs on The Food Network and the Sundance Channel.” Bio from Restaurant August. After completing my first challenge gumbo I have to say what the recipe smells like while you are making it – it is enrapturing, it is pure joy distilled into a phantasmagoria of ecstasies of heavenly perfumes on the nose and the tongue, it actually makes your olfactory senses tingle with deliciousness nomnomnom...., after making this dish you will really understand the nature of how the nose and tongue are tied together when you are smelling and tasting the recipe in all of its stages. The final gumbo is an exaltation of flavours and mouth feels, sublime is the only word. 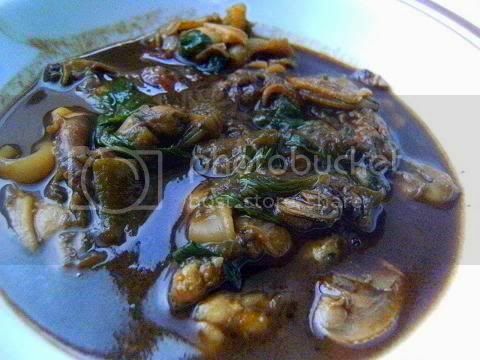 At various stages of the recipe there are moments of gustatory bliss, like when you add the (partially coooked) onions into the “black” roux, the aroma of caramelised onions overpowers the palate's ability to comprehend the delights that are being presented to it. And when you add the capsicum (bell pepper), celery and garlic the senses are assaulted again with untainted delight. It is a joy just to cook this dish. As you can tell I really like making gumbo. I was a little leery about making the roux since so many websites carry on so much about this process. 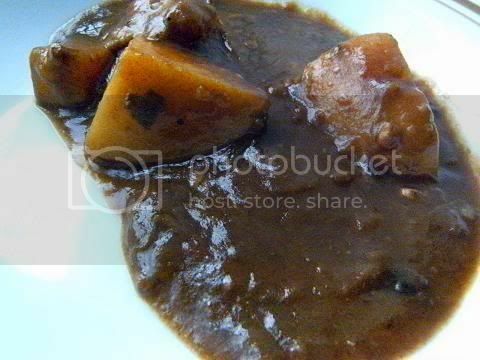 I searched on the internet and found this site about making "black" roux so I decided to make the roux the same colour as his example. I got out my best heavy-bottomed cast iron skillet and my special flat roux whisk, and proceeded to make the roux on a high heat. I added the rice-bran oil (I hate the smell of canola oil when it is heated) and the flour and started to stir and stir and stir. I was very careful to stir constantly the entire time. 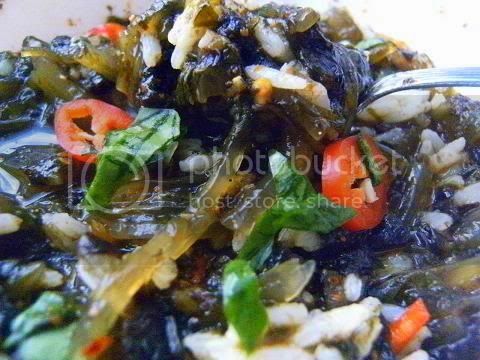 I read a number of "expert-gumbo" sites and most of them suggested a ratio of 1 part oil:1¼ parts of flour that is what I used no problems at all I made no other changes to the recipe. I used a high heat (7/10) for most of the process but I did take the skillet off the heat on occasions especially near the end of the time. The photos show the colour of the roux after various times, from left to right. When you are making the roux you cannot smell anything except at the start and on the odd occasion you will see a small gentle plume of smoke come off, it is very intriguing to see how the roux changes colour and how it thickens over the process. The biggest colour change happens between the start to 8 minutes that is from white-paste coloured to milk chocolate coloured. After 15 minutes I added the onions and the roux continued to deepen in colour since the skillet held a lot of heat. This all changes when you start adding the “trinity” and the other ingredients the smells are deliriously perfumed with the deliciousness. The final colour of the "black" roux after 20 minutes (I had added the orka by this stage) what an amazing colour and texture it had, I wished I had made four times as much roux now!!!! 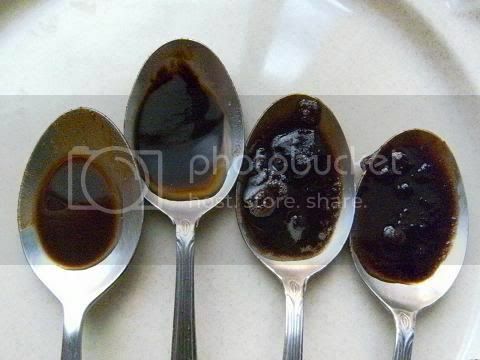 The taste of the "black" roux is amazing a deep nutty flavour that lingers on the tongue, stunning, "How can cooked oil and flour be such a gastronomic pleasure like this." I thought on tasting the cooled roux. I adored the taste of it! DO NOT TASTE the roux until it has cooled it is fiercely HOT so be careful. I wanted to make an almost “vegetarian” potato gumbo for my first attempt since I love potatoes and gumbo is meant to be a peasant dish using what you had to hand, I had a great vegetable stock in the freezer I used that, I made the “black” roux added the onions, the other trinity ingredients, the orka and the diced potatoes and cooked them in the roux until halfway tender, then I added a selection of small sized vegetables (finely grated turnip, swedes and beetroot, diced carrot, peas, corn kernels, small florets of broccoli, broad beans, precooked lentils and shredded fennel) and cooked the gumbo until all the vegetables were tender. About orka I went to the local fruit and veggie shop they only had horrible old large browned orka ($7/kg) and the cactus paddles ($4/kg) were all gone X:( , but the local Indian spice shop had a large supply of frozen sliced orka at only $2/kg a great bargain. It was interesting to see the orka dissolve, become stringy and then disappear completely just leaving its thickening power in the gumbo also it adds a light “squash/zucchini/egg plant” flavour to the gumbo. Then tabasco, thyme and Worcestershire sauce went in and in the last ten minutes I added some smoked ham for meat protein to the dish. I garnished with some lightly steamed diced vegetables, spring (green) onions, chives and sliced chillies to add colour and freshness to the dish. The tabasco, thyme and Worcestershire sauce are almost a "trinity" of flavours in themselves together they really add a wonderful unified zing to the taste. I used finely ground sassafras tea for the filé powder, it tastes like very very mild sage I thought. For the people who hate okra, capsicum (bell peppers), onions or celery don't worry you don't taste these flavours or see them at all, the main flavour profile is a deep nutty taste with flavour highlights of the final diced vegetables and ham (in my case) that lingers and lingers on the tongue so scrumptious. 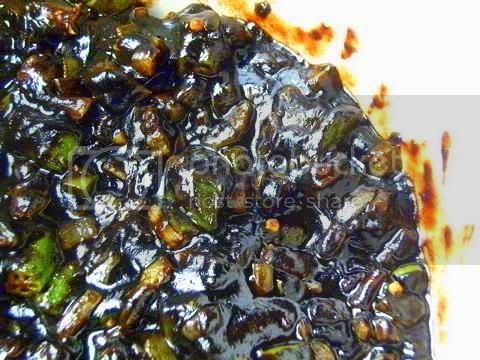 If you add the okra at the start they is no problem about it being slimy it melts away completely I read on a number of sites if it is slimy add 1 tablespoon of vinegar this helps break down the orka. 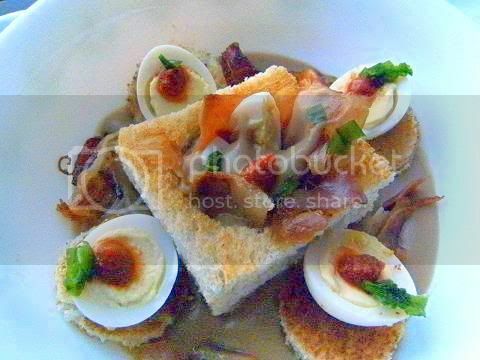 I absolutely loved this recipe it is a total revelation in taste and texture, the roux and the stock are the main flavouring agents, while the vegetables are the textural elements and the ham implants a nice touch of salty contrast to the slight sweetness of the vegetables. The final taste was sublime a magnificent symphony of harmonies, where the potatoes were the major theme (flavour profile) while the black roux acts as the deep base notes beating constantly giving the basic tempo to the dish whereas the small vegetables are the short sharp highlight accents (flavours) to the music of the gumbo. As you can tell I really like eating this recipe. There is something so reminiscent of childhood in this dish I felt like I was being hugged by my parents when I was little while I was eating this for some reason (maybe because we eat so many spuds when growing up), I could feel the vigour of the vegetables spreading throughout my body soon after the meal uhmmm a true comfort food because it actually comforts the mind, the body and the soul. Outstanding recipe! Cannot wait to see what it tastes like tomorrow. 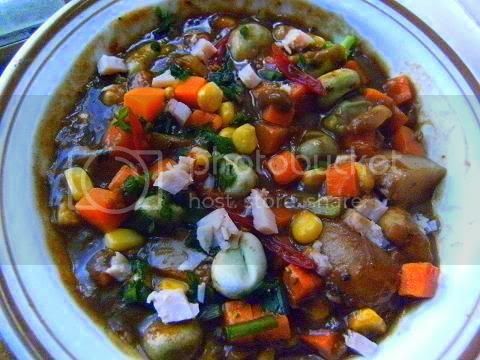 Denise thank you so much for the marvellous challenge your instructions are perfect and your photos are achingly exquisite, literally the BEST "stew" I have tasted and so easy. The ultimate comfort food. 1. The number one rule is that the roux is highly dangerous item never ever taste it or get any of it on you, it is HOT HOT HOT, always cool it before tasting it, always assume it is HOT until you are absolutely sure it isn't. 2. The roux is dangerously hot (it isn't called Cajun napalm for nothing) wear long sleeves and long pants while making it remember it is something like 200°C (390°F) extremely hot you will get a serious burn if it gets on your skin, if this happens wash it off and run cold tap water over the burn for 20 mins. Keep children and pets in the other room when making it. 3. I pre-cooked the onions until they started to caramelise then I made the roux and then added the onions when the roux was the correct colour. 4. When you add the onions the roux is still incredibly hot it will sizzle and splatter so keep a careful eye on it have a piece of aluminium foil and use that as a splatter guide, I think it best to let the roux cool a while before adding the onions. 5. Remember always stir while making the roux, don't leave it for an instant. 6. 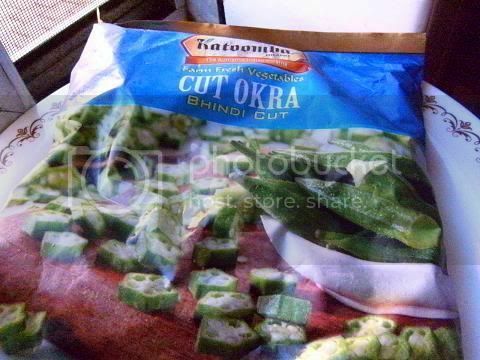 I found frozen sliced orka in the local Indian spice shop it was very cheap much cheaper than the crappy fresh orka in the produce shop. I had some free time today so I thought I would make four rouxs and freeze them for later use. I did a cull of my meat off-cuts, seafood off-cuts, rendered fats and flours in the freezer, I found a lot of things to use for the fat and the flour in the roux and some intriguing titbits to add some extra flavour notes to the roux. I even found millet flour(! ), I store all my flours in the freezer which extends its shelf life. I used a ratio of 1:1 oil:flour (by volume) for the roux, it does take a little longer (a couple of minutes) to incorporate the oil into the flour at this ratio as compared to the ratio I used for the "black" roux which was 1:1¼ oil:flour (by volume). I wanted to make a number of gumbo rouxs using different sorts of fats and flours to see what flavour and texture profiles resulted. Making so many rouxs was like living in a sensory dream all day my olfactory senses were in heaven each roux had its own special perfume of harmony. I made a range of rouxs going from blond to red to black. Roux one – I started with the fat from rendered saffron infused bacon I fried it with fine "OO" pizza flour since this finely milled flour I thought would incorporate more easily into the saffron infused bacon fat. I lowered the heat to medium so I had more control over the cooking, using "OO" pizza flour was a wise choice the final roux was very smooth and tasted like breakfast to me. 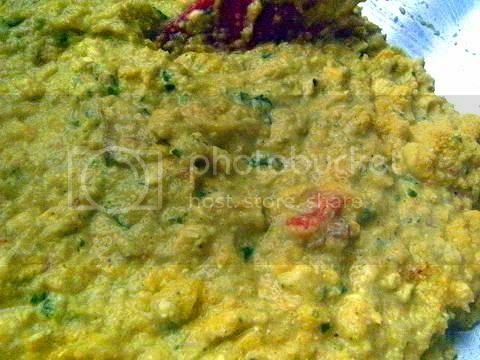 Roux two – I used ghee (clarified butter) since ghee has a much higher smoke point than normal butter which contains milk solids that can burn at high heat. At the stage where you add the onions I added prawn/lobster shells (these couldn't be used for making stock I thought) and fried the roux until I could smell 'ocean' and then added some oyster juice until the roux was fairly thin and then I stained it and gently reduced it to a medium thick liquid I cannot wait to use this for a seafood dish. Using ghee really gives a rich butter taste to the roux. Roux three – Peking duck fat is very strongly coloured and flavoured I used a millet/white/rye flour mixture it went dark fairly quickly. I added some blood orange juice and slowly reduced it to get a normal roux consistency. A lovely red colour. I experimented a little first with millet/rye/white flour mixture it produced a dark roux with a great taste that is so intriguing and hard to describe like light rye crisp bread with overtones of 'hay' and an 'earthy' cereal after taste good with strong flavours. The texture of the roux was not as fine as the blond roux, I think this was due to the millet and rye flours which are not milled as finely as normal white flour. Roux four – Chilli chorizo sausages give off a lot of fat so I had a large amount so I fried it up with white and wholemeal flour I got an intense dark red brown roux I added some more paprika near the end to add more Spanish flavouring. This is very hot and spicy great in small amounts I think the wholemeal flour adds a great dash of 'earthiness' to the dish. The roux wasn't so smooth as the "OO" flour roux I think this is due to the wholemeal flour and took longer to incorporate the fat into the flour. Roux five - was the “black” roux I made the day before using rice bran oil (which has a neutral flavour) and white flour which produces a rich nutty flavour base great for vegetable gumbos. It certainly is worth thinking about the type of fat/oil and flour you will use for your roux. Finely milled flour like "OO" pizza flour gives a very smooth roux and it was much easier to incorporate the fat into the flour. White flour with a small amount of rye or millet or wholemeal produced 'woody', 'earthy' or 'very-nutty' flavoured rouxs respectively very suitable for highly flavoured gumbos but were not as smooth as the "OO" roux. 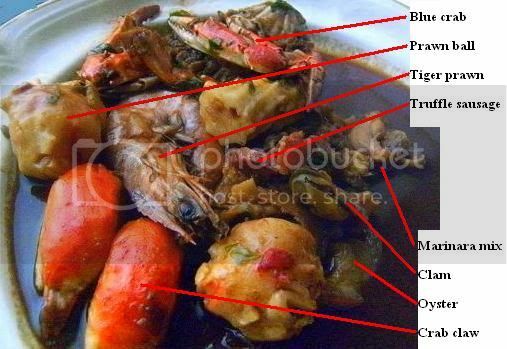 Ghee (clarified butter) produced a rich mouth feel more suitable for delicately flavoured gumbos like seafood. Rendered fats from bacon, sausages and duck strongly carry their flavour into the final roux. 1. Don't use olive oil it produces a horrid tasting roux that is oily and nasty. 2. 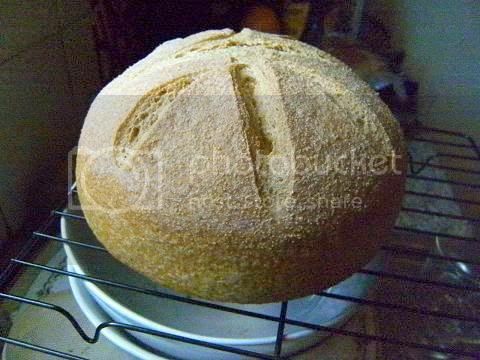 Don't use all wholemeal flour it produces a sour roux. 3. 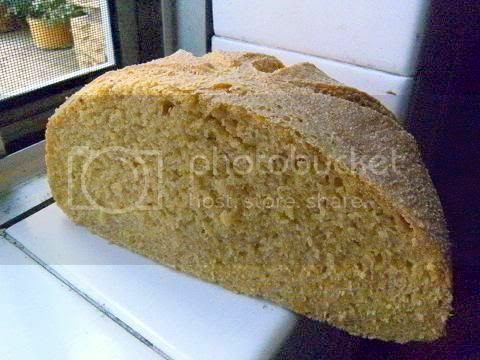 Don't use all rye flour it produces a very strange (in a bad way) sour, lumpy and gooey roux. 4. Don't use butter it will burn on high heat it does work to make a blond roux on low heat but expect to cook it for a long long time. I noticed that the oil layer evident in the first 6 samples had disappeared! in the last 2 samples. I wondered how this happen and what did it do to the completed gumbo? After some thought I figured out that it must be the addition of the "trinity" that is making the oil layer disappear somehow since that was the only difference between the "oil layer" series of samples and the "no oil layer" samples. 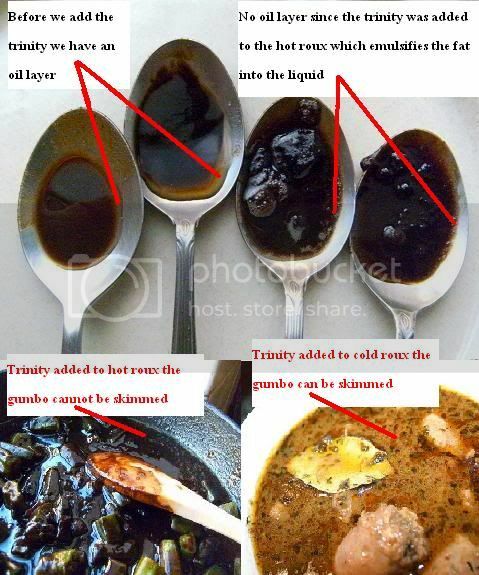 After some researching and talking to some mates in the States I gather how you put the "trinity" in the roux makes a huge difference to how the oil is incorporated into the final gumbo. Look at these two photos of gumbos - can you see that in the first photo there is no oil layer while the second photo has an oil layer that can be skimmed. This is caused by how the "trinity" is added to the roux -- in the first photo the trinity was added to a hot roux while in the second photo the trinity was added to a cool roux. You see in the old days before modern stoves with a nice constant heat, gumbo rouxs' were made on a low heat where it could take 100 minutes to make a dark roux, when the roux was finished, most of oil layer on top would be skimmed off and the trinity would be added and cooked (on the same low heat) then the other ingredients would be added-- using this method the final gumbo would have an oil layer. With modern stoves a dark roux could be made in 10 minutes on a high temperature and to stop the roux from burning the trinity would be added to lower its temperature but this also caused the oil layer to be emulsified into the gumbo so the final dish looked a bit like mayonnaise (a shiny emulsion). Now you might ask which method makes a "true" gumbo - the answer is that both methods produce "gumbo", of course I got several emails from my mates saying the low-temperature or the high-temperature method was the one my mum used to make gumbo when I was growing up and that was the "correct" method to make a "true" gumbo. this sort of disagreement is very common when you have a base recipe that can have countless variations. I thought I should share this titbit of information with you if you used low heat to make the roux and produced a gumbo that had oil drops on top. Since Good Friday is tomorrow I made gumbo z'herbes (a green herb gumbo traditionally served during Lent) it is labour intensive (lots of chopping) and takes a long time (lots of simmering), basically it is an enormous amount of greens (it must be an odd number of varieties I used 19 types) that are simmered for two hours then this is added to a gumbo roux and simmered for another hour. This would be a very expensive recipe normally but I'm lucky a sustainability garden opened (nine months ago) two door's down from my place next to the old tiny disused pioneer cemetery, it is overflowing with green leafed vegetables at the moment and yesterday they needed some help so I volunteered and I mentioned that I was making gumbo z'herbes for Good Friday they said I could take as many leaves as I needed. 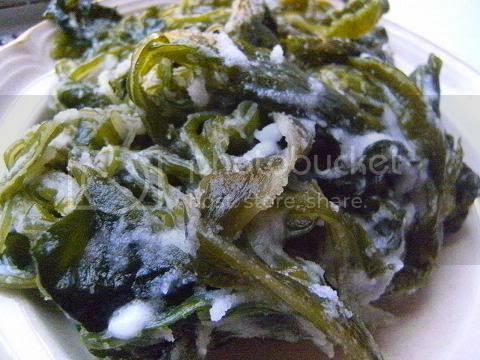 The story goes that for each type of green in it, a new friend will be made in the coming year, so feel free to throw some of your favourite greens into the pot and make some more friends! I used a lot of “Asian” greens, and a whole array of “European” greens, I took note of the names that the lady called them. 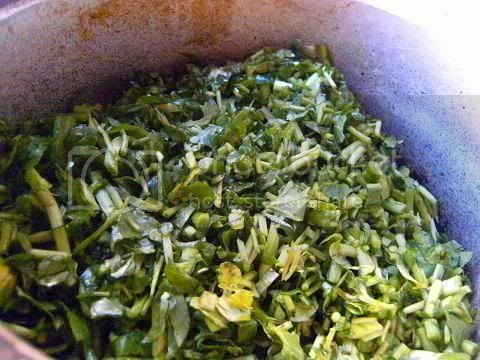 The quantity (in volume) of uncut greens you need to make this gumbo is incredible (about 12 litres (three gallons)) but they do collapse when cooked to about 4 litres (1 gallon). I had my doubts about this recipe (it isn't the best looking dish)... I had my first spoonful...I tasted it … WOW what was THAT that just happened... I had my second spoonful ...again... THAT just happened again! ..I realised after some thought I was tasting... and I couldn't believe it... delicious “bitter”.. and it was SUPERB. For an instant I was stunned, amused and euphoric then I realised how impoverished we are in our cooking culture we have so few dishes in Western cooking that emphasise the “bitter” taste sensation. 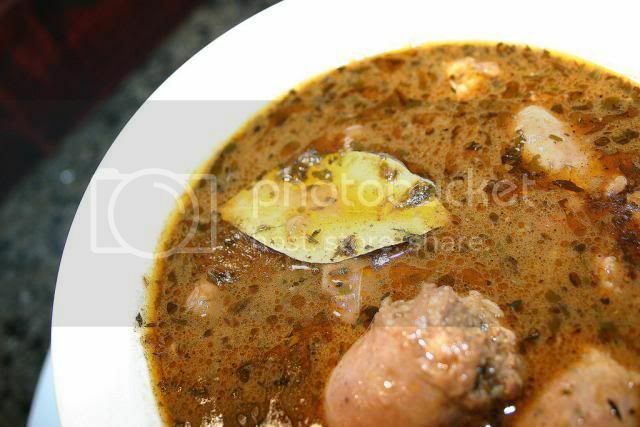 This Lent gumbo has an exquisite elegance that boarders on revelation, its “bitterness” is so sophisticated and toothsome. It was a total pleasure to have and savour an almost unknown, greatly underused and totally misunderstood taste sensation simulated to its maximum culinary acme in this dish, after eating this gumbo you will grasp that yes we really do have a 'bitter-tooth” in our palate (compare with our “sweet-tooth”), the “bitter” greens meld so well together, this was the absolute hit of the test luncheon I held for this recipe, I cannot wait to see what it taste like on Good Friday. Don't worry as you can have deliciously sweet (a good taste) and cloyingly sweet (a bad sort of sweet) you certainly can have deliciously bitter as a taste as this recipe will testify if you try it. 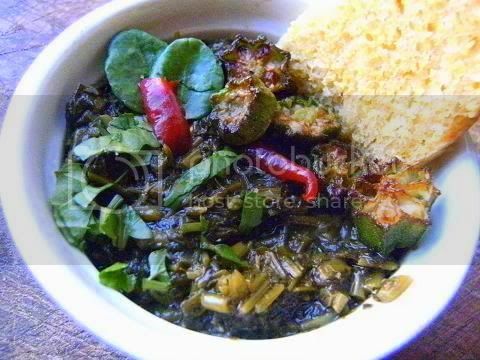 If you can get perilla leaves do use them they add a wonderful overall herbal taste to the dish. 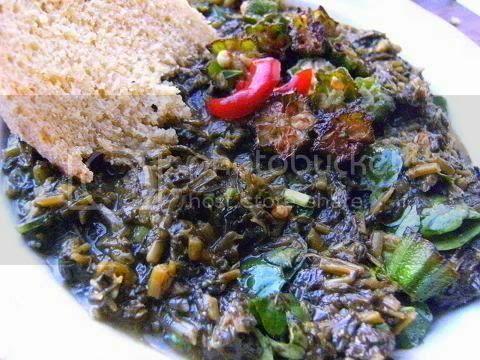 Also there is something about so many greens in one dish that seems to scream “earthy goodness” it really tasted of “health”. It is a real shame that this dish is not made more often throughout the year I definitely will make this again when there is an abundance of greens. I served it with home-made jalapeño cornbread and deep-fried okra slices. I really liked how the gumbo filé worked with this gumbo. The filé goes in at the end when the mixture is cooling, either in the pot or at the table. Start adding filé a little at a time you will find that the soupy mixture will take on the classic gumbo texture: kind of gooey and gelatinous. Then add a little extra then your gumbo will be perfect. Filé's flavour is unique; I can only describe it by saying, it tastes like gumbo. 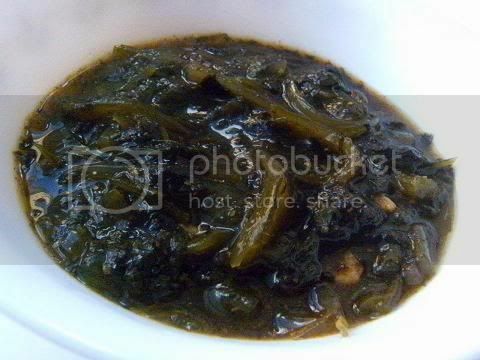 Reserve about two cups of the smallest and most tender green leaves for garnish. 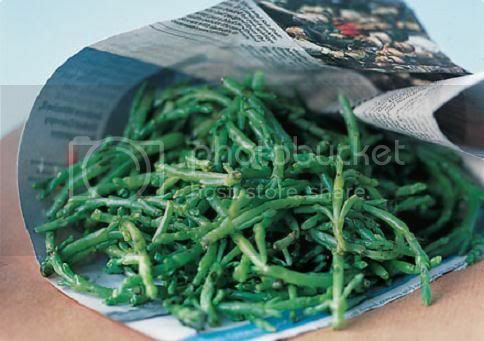 Wash the rest of the greens thoroughly and remove all stems or hard centres, chop the greens finely. Boil them all together in the stock with the ham hock if using for about two hours. Strain reserve the liquid and the greens (and the ham hock). 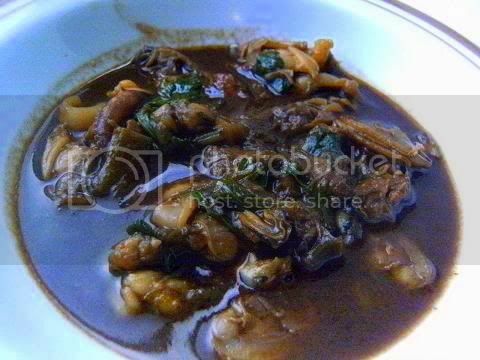 In a large, heavy-bottomed stock pot make a brown gumbo roux of the flour and ghee. Add the trinity (onion, capsicum and celery) and sauté for 10 minutes. Add the chopped parsley and sauté 5 more minutes. Add the reserved cooking stock, greens, (shredded ham hock if using). herbs, spices, and seasonings. Simmer on low heat for 1 hour. Adjust seasonings as necessary. Serve in large gumbo bowls with a 1/2 cup of rice. 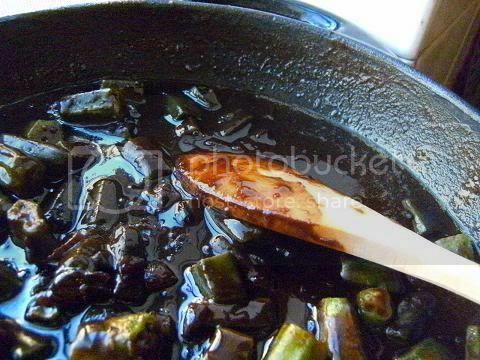 Or ladle the gumbo into large soup bowls and serve with cornbread slices. Garnish with the reserved green leaves. 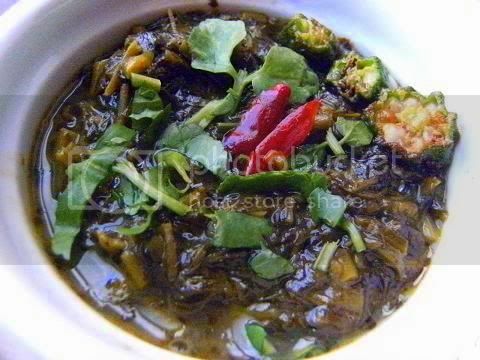 fried orka pieces and red chilli slices add gumbo filé as desired. Combine all the ingredients into a large bowl using a plastic scraper (or your hands) until you form a shaggy dough about 2 minutes. Cover the bowl with plastic wrap and a clean tea towel and leave overnight. The next day punch down the dough and form a loaf. Place into a 6 inch (15 cm) round baking pan (1½ inches 4 cms high), cover loosely with plastic wrap let rise until doubled in volume. Preheat oven to 220°C (430°F), slash and bake the risen loaf for 40 minutes. Since the saffron infused bacon roux tasted so much like "breakfast" I had to make a gumbo breakfast recipe from it. I love beans on toast with eggs and bacon for breakfast (I always order it if I'm eating breakfast at a café) so I decided that these ingredients should be the basis for my gumbo breakfast dish. To the saffron infused bacon roux (since it was made from OO pizza flour) I added an intense ham-bone stock with the caramelised trinity (that I did separately using finely grated vegetables using my microplane since I wanted a smooth result), I added soaked white beans and cooked them until mushy soft and then using a hand mixer I made the (gumbo) purée, I was very pleased how creamy and smooth the final purée was (it was like an airy mousse) and it packed a punch of ham and bean flavour with a saffron glow. 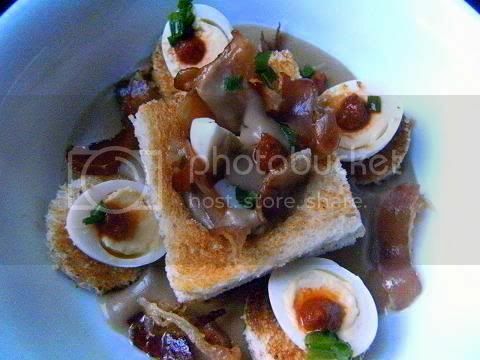 I ladled out a generous amount in a bowl and placed a "vol au vent" toast stack filled with the gumbo purée, quail eggs, saffron infused bacon strips, chives and harissa paste into the centre and I used the cut-out toast pieces with quail eggs and chives as a garnish around the toast stack and added some more crisp saffron infused bacon strips for extra flourish. For me it was b.r.e.a.k.f.a.s.t. personified. 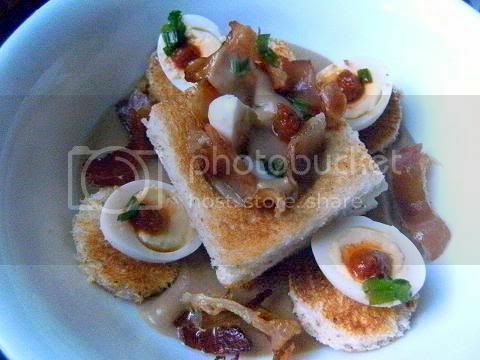 The ham and white bean gumbo purée was so filling, the toast stack was fun to eat and the extra eggs on the round cut-out toast pieces were so dainty looking, these components all together were a wonderful and satisfying start to the day while the saffron flavour added a special opulence to the dish. I was very happy and full! I wanted to make a showy and flavoursome birthday treat for a close friend's 25th. 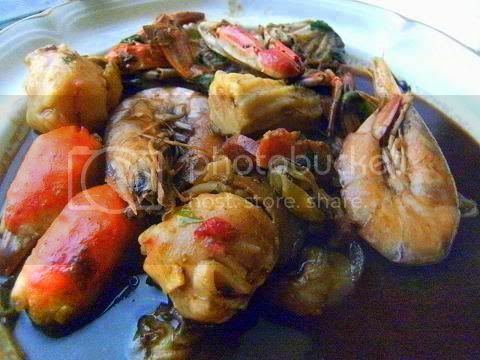 There is something so special and indulgent about seafood gumbo it is a dish that can be made relatively cheaply if you use the seafood off-cuts that any fish market produces (fish heads, fish bones and tiny dried prawns for the stock and for the bulk of the gumbo you can use seafood off-cut (marinara) mixtures). 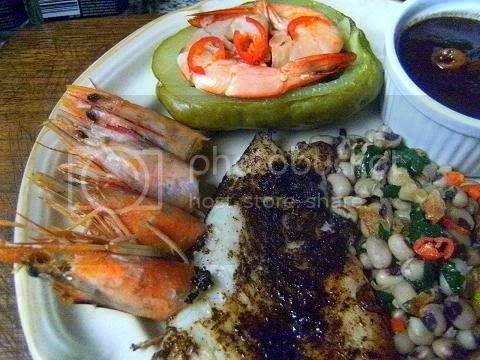 But this basic “cheap” recipe can easily be made into a spectacular dish if you festoon it with wisely-chosen large handsome pieces of fresh, frozen, prepared and imitation seafood. I decided to incorporate the taste sensation of umami as the major gustatory component of the gumbo. 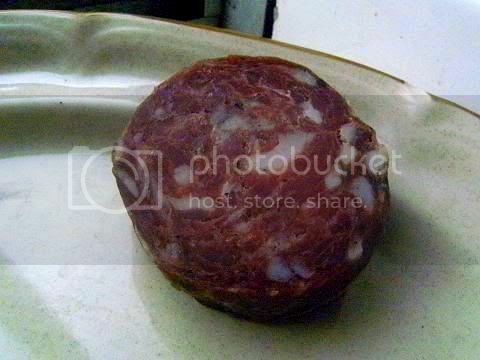 Umami means "pleasant savory taste" also it enhances the other flavours in a dish. I went to the Sydney seafood markets and indulged in some fabulous frozen blue swimmer crabs, frozen clam meat, frozen oyster meat, fresh giant tiger prawns (shrimp) and fresh seafood marinara mix (squid, octopus, mussel, "white" fish, tuna and "red" fish). Also I went to the local Asian seafood market and picked up some prepared spicy chilli prawn balls, top quality imitation crab claws and some seafood stock flavouring spices and herbs. The local speciality butcher had some excellent smoked truffle sausage (using real truffle) on special ($60/kg half price!) so I got some of that also. I concentrated and made an effort to make the best seafood umami stock I could for the gumbo, I fried one kilogram of tiny dried prawns ($4 from the local Asian shop) in ghee until they turned red then added some fish bones, three tablespoons of bonito powder, two tablespoons of seaweed paste, two tablespoons of fried tomato paste and the other (fried-separately) stock ingredients and simmered this for 30 minutes (making sure that no bitter flavours developed in the stock) which produced a strongly flavoured seafood stock with a powerful umami punch. 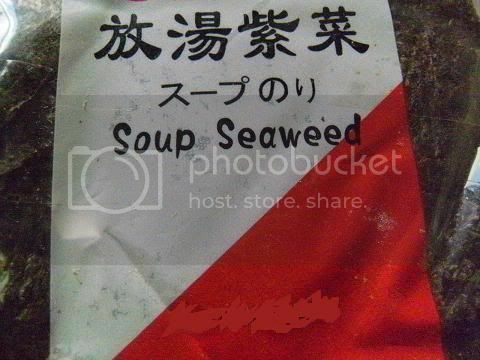 Bonito, seaweed and tomato are rich sources of the umami taste sensation which as mentioned already greatly enhances the other flavours in a dish. Then I made a “black” roux (using ghee (which has a high smoke point as compared to butter) and "OO" pizza flour which took eight minutes I'm getting faster at making it LOL LOL) I added the pre-fried trinity, sliced orka, thinly sliced and fried smoked truffle sausage and cooked it for a few minutes and added the umami stock. 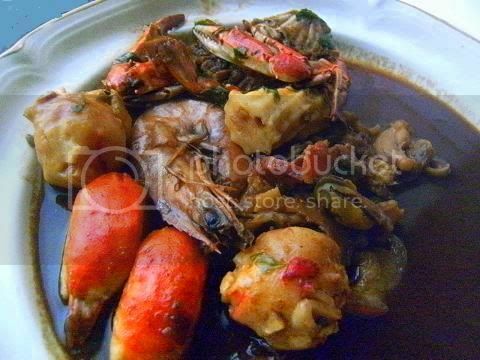 The blue crabs were added and simmered for 45 minutes, then all the other goodies were added and simmered for an extra 15 minutes and the gumbo was finished. Truffle is the only food that contains all three umami stimulators this means a tiny amount of truffle strongly enhances any and all flavours in a dish. A small truffle will instantly perfume a huge room if it is exposed for an moment, the fried sausage was utterly magnificent I can totally understand why truffles cost $2000 to $4000 per kilogram for the locally grown fungus (Tasmania Australia). 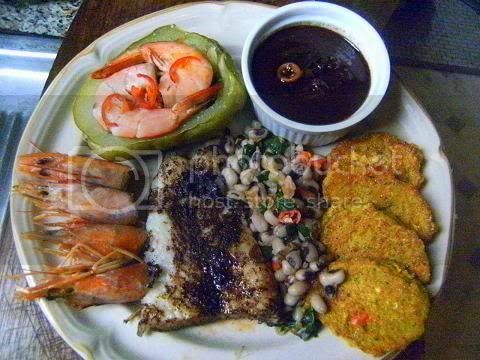 I absolutely loved the intense dark colour, soupy mouth feel and strong seafood umami taste of the gumbo liquid and when combined with the different show-off pieces of seafood made every mouthful an ambrosial bliss attack on the senses. The contrasting mouth feels of the tasty morsels counterpointed marvellously against each other. 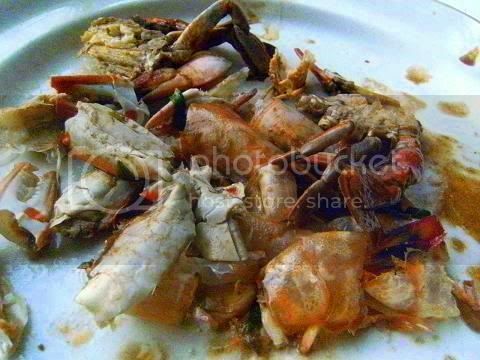 The prawn balls and crab claws worked really well with the clams, oysters and the marinara mix and it was fun to peel the prawns and crabs, having so many contrary ways of eating each titbit made the dish feel like a banquet. And the best were the small pieces of truffle sausage on the bottom of the dish so so yummy well worth the expense. I was a little apprehensive about using prepared and intimation seafood but they worked very well and looked so exquisite in the final birthday dish. And not that expensive for a special party only $6.60 per serve. 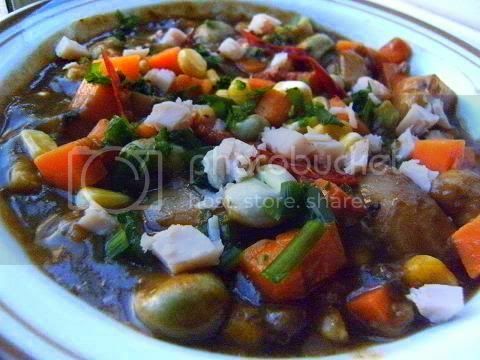 I loved the combination of tastes and mouth feels in this meal, I made sure that the clam gumbo was the principle flavour and mouth feel that held all the other dishes together. The clam gumbo complimented so well with the Hushpuppy fritters which are sweetish and the slightly bitter blackened catfish, the stuffed alligator pears are amazing the fruit goes so well with the prawn and ham mixture and the texture of the shell is soft yet firm like a prawn. 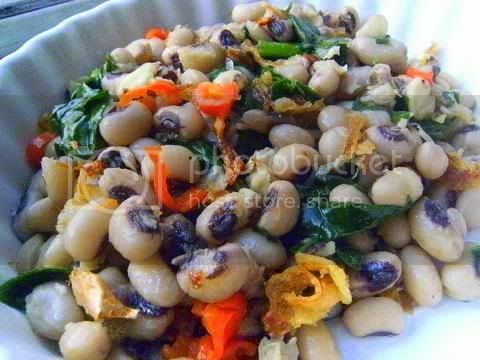 The black-eyed peas are a wonderful dish so filling and warming to the body and soul. And the crisp prawn heads have such a loud crunch when you eat them LOL LOL. Prawn & Ham Stuffed Alligator Pears – alligator pears also known as chokos (in Australia), chayotes (Native American name) or mirlitons (Southern States of America) are a squash that is a little like a cross between a potato and a cucumber in taste and texture. 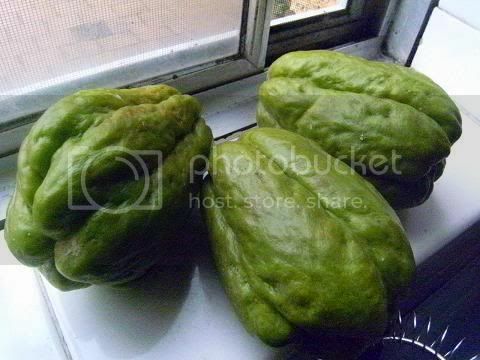 Chokos are a very old fashioned fruit in Australia they were common place on the dinner table but of late they have been underused. 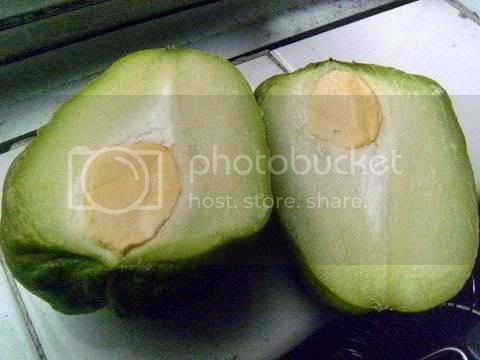 Chayotes steamed then stuffed with a spicy prawn (shrimp) and ham mixture and baked are a famous New Orleanian dish called Mawmaw's Stuffed Mirlitions. 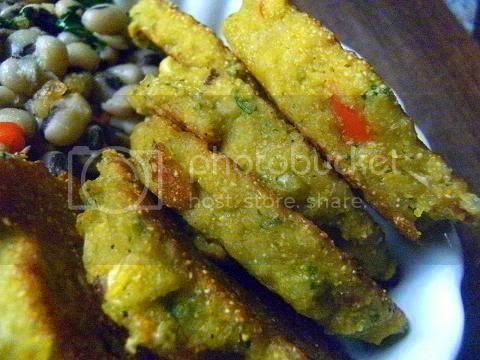 Chilli & Herb Hushpuppy Fritters – hushpuppies are a traditional treat eaten with seafood at carnivals, shows and at home. 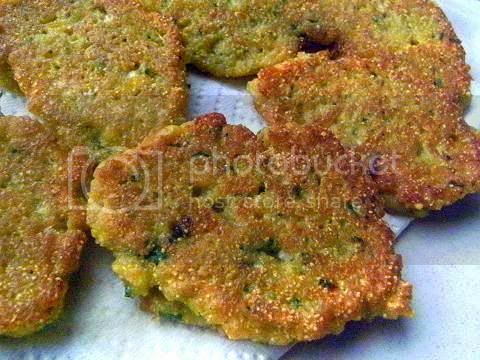 They are made from self-rising cornmeal/white wheat flour, fresh corn, plenty of spices, finely chopped red chillies, fresh parsley and thyme. They are usually deep-fried but I made small fritters (1 heaped tablespoon) from the batter. 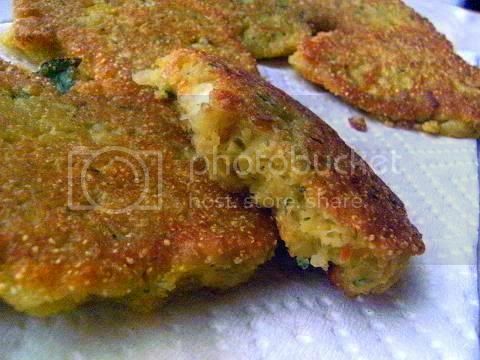 The cooked fritters are really delicious and with the addition of spices and herbs are a treat of the taste buds. They are sweet which was a surprise (I had halved the sugar! in the original recipe). 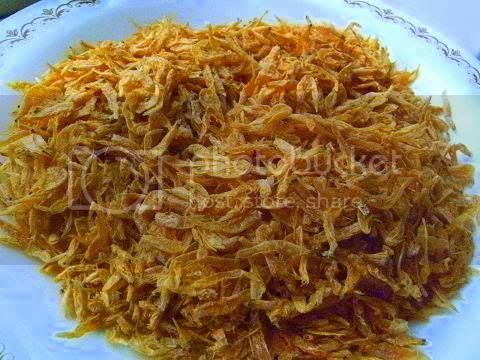 The recipe uses one large grated onion and the liquid given off and an egg as the binding agents which really gives a great taste to them. Notice the lovely colours running throughout the fritter. Crispy on the outside, nice and light on the inside and overall super tasty. 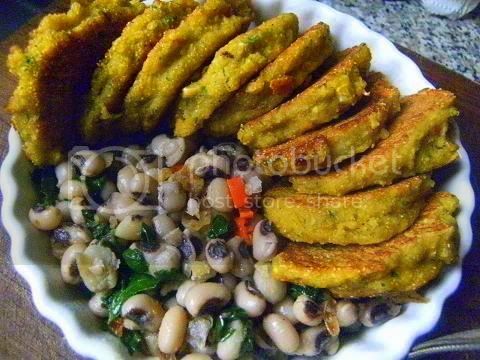 Spicy Black-Eyed Peas – are the quintessential side dish in the Deep South I added some greens, red chillies and some home-made spicy prawn shell grits. 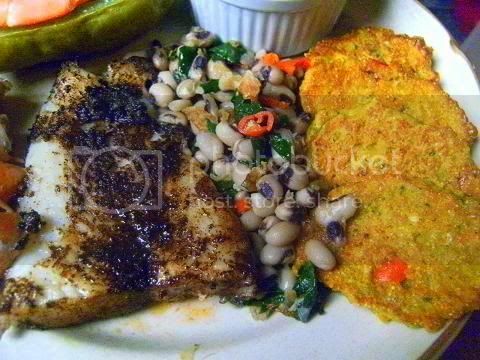 Blackened Catfish – another traditional Deep South dish catfish (known as basa in Australia) which is cheap ($7/kg) and super delicious, a mixture of spices and herbs are applied to the fish fillet and then pan-fried until the coating has become blackened. A very moist fish indeed a special treat of any fish lover. Notice how moist and flaky the interior of the catfish is a lovely texture. I like blackened fish to have a strong smoked flavour so I use a lot of smoked paprika you could alter the spice mix to suit your tastes and what you have on hand. Though salt, sweet paprika, cayenne/black/white pepper, cumin, thyme and oregano are the usual ingredients in most spice mixes. 1. Mix in a small bowl all the spice mix ingredients set aside. 2. Heat a heavy cast iron pan on high heat until extremely hot, about 10 minutes. 3. Pour ¾ cup melted butter into a shallow dish. Dip each fillet into butter, turning once to coat both sides. Sprinkle both sides of fillets with spice mixture, and gently pat mixture onto fish. 4. Place three fillets into the hot pan without crowding. Carefully pour about 1 teaspoon melted butter over each fillet. 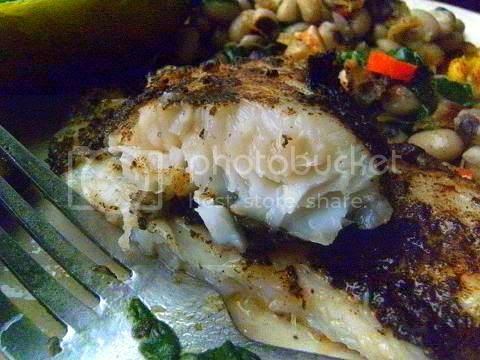 Cook until fish has a charred appearance, about 1 to 2 minutes. Turn fillets, spoon 1 teaspoon melted butter over each, and cook until charred about 1 to 2 minutes. Repeat with remaining fish. 5. Before serving, add another teaspoon of melted butter on top of each fillet. 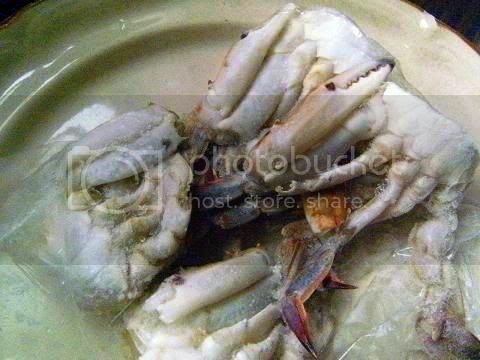 Crispy prawn heads – these are so tasty, the crunchy head is a joy to eat. A coating of Cerole spices is applied to the cleaned and fried prawn heads. I adore seaweed soup, the seaweed gives the soup a deliciously light tangy “sea” flavour and I have had been craving it for a while now so I decided I just had to make a variation on gumbo z'herbes where instead of using a load of 'land' green vegetables and herbs I substituted with three types of seaweed (sea greens) and the über scrumptious samphire (also called sea asparagus, glasswort) which a friend obtained for me free from Kangaroo Island in South Australia, I call the final dish Gumbo Mer D'Algues. I will be serving this tonight while watching the Eurovision Song Competition with friends. 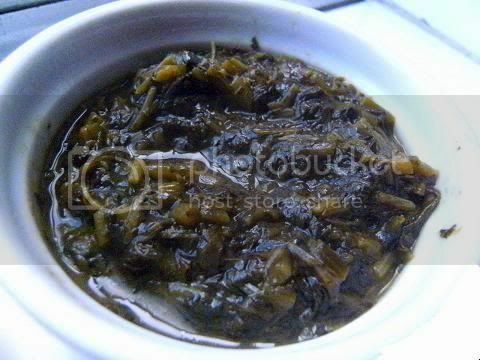 I used edible kelp (which dissolves totally and is a thickener i.e. 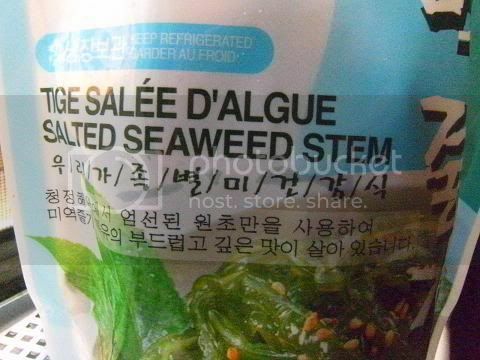 a substitute for the orka), Korean salted seaweed for its lovely texture when cooked and nori soup strips for their taste and colour and the marvellous samphire (a delectable sea-side herb which when bitten into releases a salty burst of “sea” tang cost free a friend found some and brought it back for me, usually $10/50 gm! 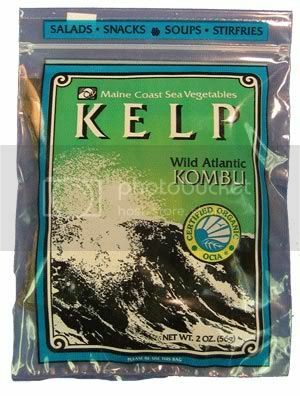 ), the dried kelp was $4/110gm (two packets), the salted seaweed ($2/500g) and the nori soup stips $3/100gm, I soaked (an hour) and washed the kelp and salted seaweed twice. I made a stock of chicken bones, and mirepoix then I made a light roux using ricebran oil and white wheat flour. 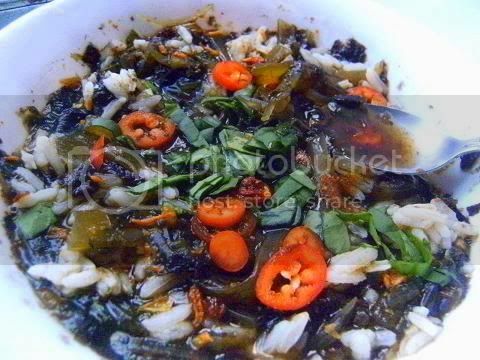 I added the “trinity”, the soaked seaweeds were simmered for 2 hours then I added the nori and simmered for 30 minutes then the samphire which was simmered for 15 mins. 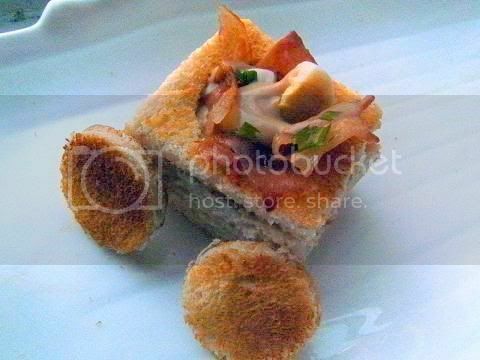 I just loved everything in this post, but the most was that bread! So wonderful! Thanks for sharing your flat roux whisk. I'll have to pick one up. Great job on this challenge! I seriously need to come to your house! I am so amazed at some of the things you create. What an amazing myriad of delectable dining! That is an awful lot of gumbo you had there! I love the creativity you bring to your dishes. Thank you for sharing the roux "timeline" with us - it was helpful for a first time dark roux-maker! And those hushpupies look AMAZING! Thank you so much for sharing the different steps of the roux, it certainly helped all cooks. Amazing collection of gumbos! You went all out , as always, great job on the challenge! thanks for leading the way on the gumbo challenge Audax! Your discussion of the cold roux vs. hot roux was very informative. Love all the varieties that you created - Yum! Cajun napalm!!! That is too funny! As always, your post was great. 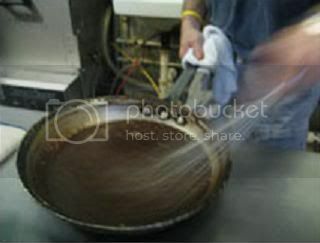 I liked the inspection of the roux and how it changed over time. 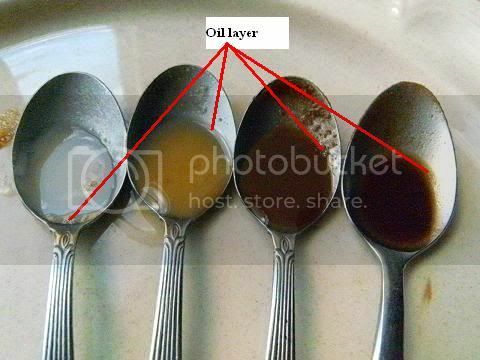 I was also wondering about the oil layer as I was cooking, and wondered if I did something wrong... I guess it was all in the timing! I love the sheer quantity of recipes that you make every month. I am always so impressed that you can take each challenge to a whole new level with your diligence. I want some of your hushpuppies. They look amazing and go perfectly with gumbo. If you do decide to write a cookbook, then I would love to buy a copy. You are always an inspiration for fellow Daring Cooks. We might see Audax Artifex as the next TV chef! Such creative combos, and I love the row of spoons showing the different strengths of roux! Your enthusiasm always amazes me. 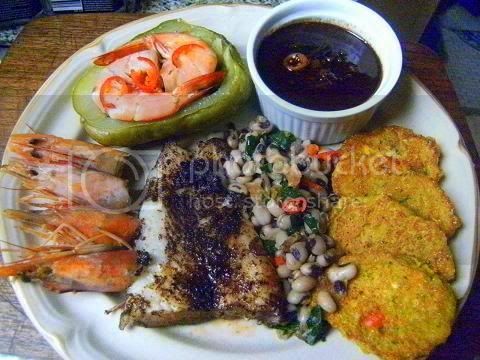 Blackened catfish and black eyed peas really had my mouth watering. Great work on all your versions. This is one mess o' gumbo! How do you ever find enough people to help you consume it all? Great job. Audax! This is beautiful! I love your information on the roux. This is really information that can be used for all types of sauces. 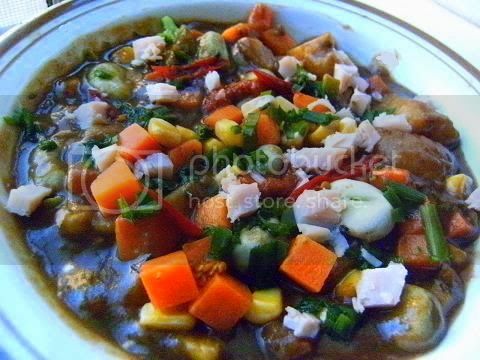 Love all the gumbo variations you made audax, they look delicious! Great job on your creative, colourful and delicious looking gumbos. It is such a fun and interesting dish to make! Wow - once again I stand in awe at the work you put into the food. Excellent job. 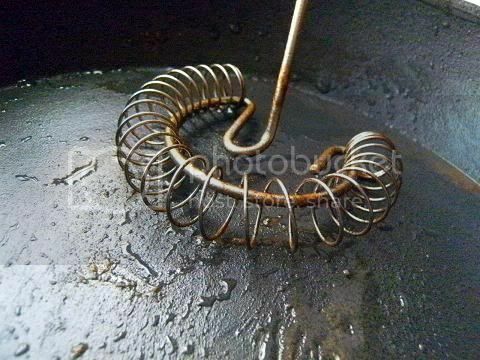 Love the pictures of the stages of the roux. Very informative and great for a beginner cook to pick up some tips. Kudos! Wow, what an incredibly thorough post. I'm so glad to have found your blog. What an awesomely informative post! That's a lot of gumbo - thanks for sharing the interesting research and helpful comments. Wow Audax! this is just amazing :) all of your gumbos look absolutely outstanding, and this is just so helpful and informative as well! thank you for taking the time to provide so much information and help! mmm to spend a week in your house would be wonderful with all of your talent! Wow. That was an amazing post. Thank you for sharing all your tests and experiences, fun to read! And your dishes look delicious. Wow, you really went all out on this challenge. Great job as always. I liked this challenge and all the potential it has for a variety of ingredients. I never had any oil separation in the sauce, and I did add the onions etc while the roux was hot....so maybe that was the reason. Liked the cornbread for a side too! Gosh, I always learn so much from your posts, Audax! The photos are all great, and I especially love the roux spoons. 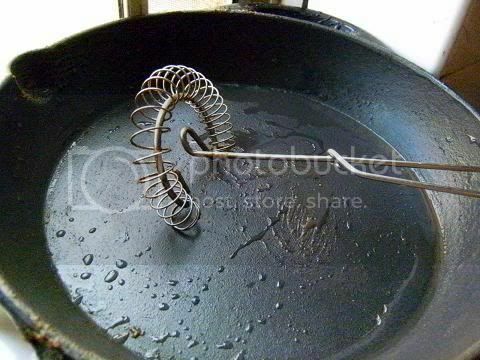 :) (also, I've always seen roux whisks, but never knew that that was what they were!) 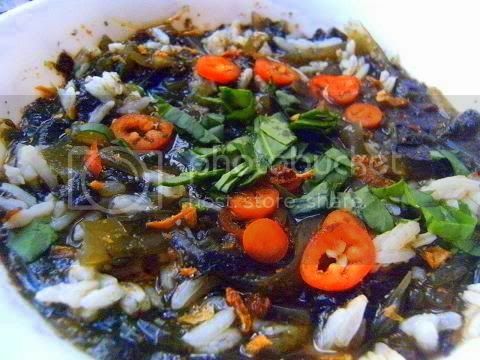 Glad you also liked the gumbo z'herbes. Amazing amount of greens in yours! Wow, I am so impressed, I think this can be posted directly on Wikipedia - I bet they could use more experimental data on the roux. I especially love the "raws of roux" with all the spoons :-). And I'm glad that you've found this challenge so inspirational ;-) "pure joy distilled into a phantasmagoria of ecstasies of heavenly perfumes"
Fantastic photos Audax, I love the scientific take on your cooking, especially the spoons comparison. 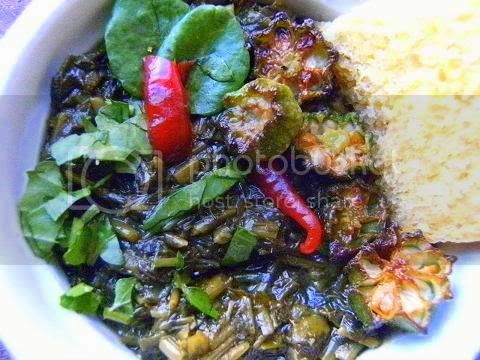 After reading about the Green Gumbo, I'm definitely going to be making some. Awesome job on this challenge, as always. I'll just completely lack originality and say Wow! I was barely gathering the courage to start this challenge and saw you posting all those things in the forum...wow again! Audax - Thank so much for your compliments on my hosting of this month's challenge; it really means so much coming from you! I can't begin to tell you how excited I was to have introduced you to gumbo and southern cooking. Not that I'm an expert by any means - I've just discovered many of these dishes myself. You went all out, as you do month after month, with such generosity and dedication to the forum and helping us all. You continue to be such an inspiration in your creativity, techniques, and energy. Wow! Fantastic, job, as always, Audax! I'm speechless. Audax I am speechless by your post. What an incredible study on a wide range of gumbos. So imaginative. And all your experimenting and documenting the roux, wow. You gave 200% of yourself this time around. You will be eating gumbo for months too I bet. Amazing cooking. This is a authentic Gumbo class!!! You are a Gumbo Master! That is amazing! I can't believe the fore thought that must have gone into taking the photos! 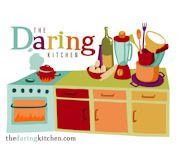 You've been doing the Daring Cooks for a while, I bet! I am so impressed & have learned a lot for next time. Thank you!!! Fascinating, Audax. I ended my post by saying I should try a vegetarian version next as it would be more economical. 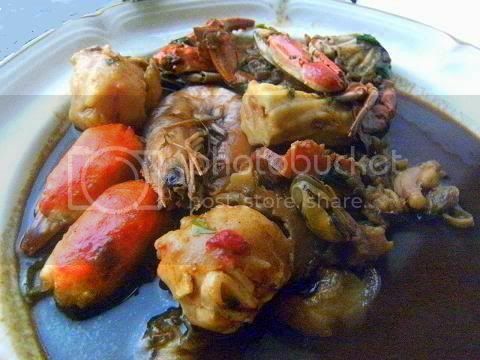 Now that I've seen your success I know that gumbo still is great without meat! You did a great job with this challenge as usual. Audax, you are amazing. Your scientific process of examining the roux at different stages is so instructive. I also agree about how intoxicating the smell of gumbo is, I love your description of it. Wonderful job, once again! Love how informative yours is!!! Lovelovelove the instructional nature to your posts. The spoons were a great idea! I've loved reading about your gumbo adventures this month! 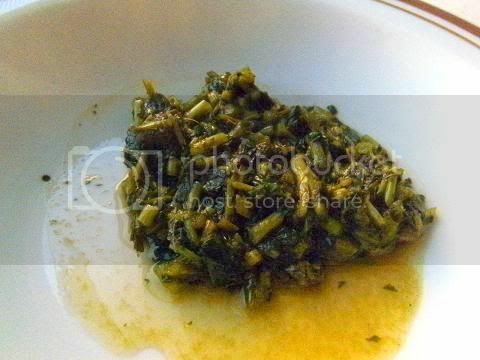 Your description of the gumbo z'herbes was especially captivating. It sounds wonderful. Thanks for your info on the roux as well. This all looks so, so delicious! I can't believe I missed this challenge. I LOVE gumbo. I've been meaning to check out your blog to see what you made, and of course it looks wonderful. 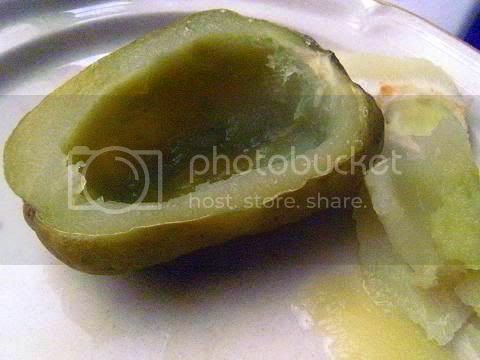 I burnt my tongue taste testing my roux :( Damn hot!! Took a few days to come back to normal. 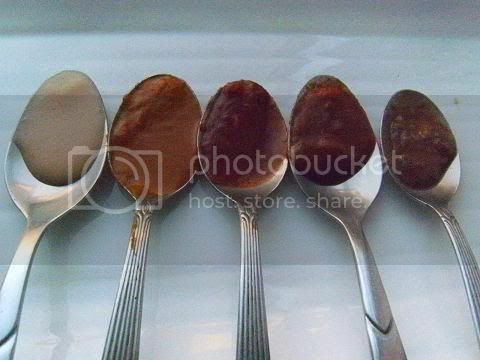 Love the spoon shots of different timing of the roux. I say this as the oil and flour and cooking actually scared me a bit for this challenge. This southern girl is astounded at your gumbo variations! I loved so much about your post but you totally won my heart with the fried okra. 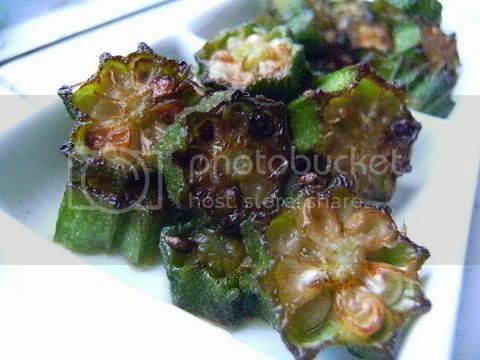 I never liked okra any way but fried and this was a beautiful variation! Oh and that cornbread!! 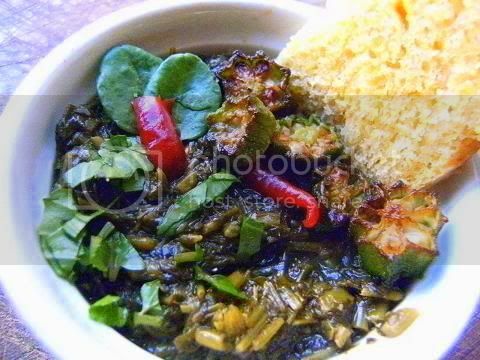 Wish I had some pot likker and your cornbread right now!